Water Garden Ltd have a range of equipment to allow you to construct a garden fountain display in your home. Installation services also available. 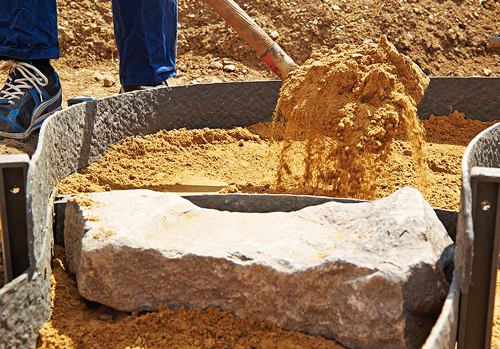 If you are planning to install a decorative fountain display in your garden, we have a range of construction equipment which will make installation as easy as possible. Stunning water displays such as vertical water jets and cascading water sheets can be created and we can supply everything you need to complete the task yourself. If preferred, we can also suggest a suitable installer to complete the feature installation for you and we have tried-and-trusted landscapers across the UK who are able to assist. The 1st place to start is with a water container which will hold sufficient volume to allow the feature to run and recirculate the water without the need for mains water connection. Our reservoirs and steel cover grids are an ideal method of holding water underground whilst providing a sturdy support platform at ground level for mounting the feature and providing a safe support for loads up to 150Kg. The steel support grids can then be covered with a decorative aggregate such as pebbles, cobbles or slate chippings to cover and disguise. 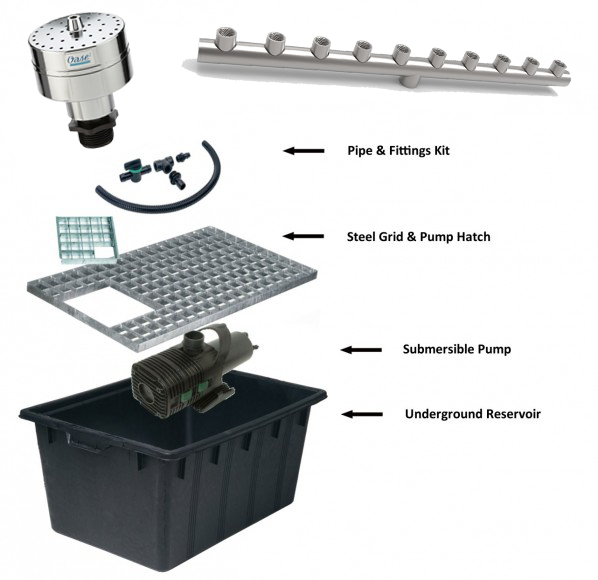 A submersible pump can be placed inside of the water reservoir to provide the flow via a flexible hose or, via a decorative fountain nozzle to offer vertical water jets above the grid. Our stainless steel cascading Water Blades are a very popular feature and can be built into a brick/block wall or wooden sleeper wall and results in a clear sheet of water falling in free flight into the hidden water reservoir. If you are looking for a stunning centrepiece, our Spray Rings and Spray Bars create a stunning array of individual water jets and can be incorporated into an existing pond or our Water Reservoirs. Water Garden Ltd also produce our own Pondless Fountain Kits which include everything you need, including reservoir, pump, fountain nozzle and fittings to create a recirculating water feature in virtually any garden space. We also offer LED illumination and electrical controllers to complete your project.